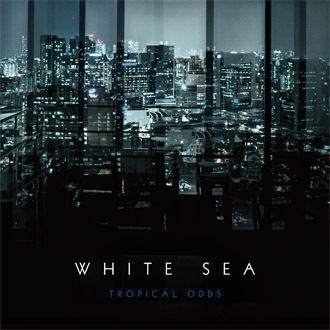 Tropical Odds is the second album by White Sea, the solo alias adopted by American singer, songwriter and producer Morgan Kibby. Born in Alaska, and now a resident of Los Angeles, Morgan fronted The Romanovs before joining acclaimed electronic music group M83 in 2007, co-writing, arranging and playing keyboards on the albums Saturdays = Youth and Hurry Up, We're Dreaming, as well as completing several world tours. As White Sea, her first solo album In Cold Blood arrived in 2014, a dramatic debut praised by Billboard for its 'canyon-sized hooks, knowingly grandiose melodies and succulent vocals' and judged 'pop's newest break-up classic' by Flavourwire. Outside of M83 Morgan has also collaborated with artists such as Greg Kurstin, Panic! at the Disco, Mark Ronson and School of Seven Bells, remixed Ellie Goulding and Britney Spears, and composed the award winning soundtrack to Eva Husson's provocative 2016 movie Bang Gang. Now gathered together in album form, the musical moods on Tropical Odds range from the sombre reflections of Gangster No. 1 and Yesterday to the hedonistic rush of Stay Young, Get Stoned and Never a Woman, high drama on Bloodline and Arcadia, and heartbreaking balladry on Secret, One Bad Eye and Lessons. Vinyl edition includes free digital copy of the album. A postcard signed by Morgan will also be enclosed with the first 100 mailorder copies ordered direct from Crépuscule. Available on vinyl, CD and digital download (MP3). Mailorder copies of the CD are shipped in a special LDDC slipcase. To order format please select correct shipping option and click on Add To Cart button below cover image, or else contact LDDC by email for other payment methods. Official White Sea website: http://whiteseamusic.com. "Tropical Odds can be compared favourably to In Cold Blood to the point where one can claim it's even better. Gangster No. 1 is a propulsive, regretful number that captures the ennui of ageing in stark fashion, light piano pounds decorating an eternally-sawing synth cello over which Kibby lays stark lyrics. While she talks about vague traumatic heritages in Bloodline and serves as some sort of omniscient spectre in the appropriately ghostly One Bad Eye, Kibby has a way of leaning toward specificity but backing out at the last second, lest something become too identifiable. While certain tropes may echo that of other current pop stars - Tove Lo could've easily used a song like Yesterday to ground her last record - Tropical Odds still succeeds because all the songs, despite being recorded and released piecemeal over the course of a few years, still sound like they come from the same artistic place, all cohering together while still sounding like a logical progression from In Cold Blood." "Tropical Odds is the follow up to In Cold Blood and a pure electropop delight it is indeed. White Sea here has produced what I imagine is one of the most commercial releases ever on Les Disques du Crepuscule, but also one of depth and class. For a start Morgan Kibby has a pristine, clear voice and manages to use it effectively without showing off or over-singing. Her songs also have a keen eye for detail and hard truths, rather than the simple-minded smokescreen of more cynical Pop outfits. The vocals combine perfectly with the musical backdrop of electronic beats to construct a delicate, gorgeous dream pop landscape that shifts from the sparsely arranged One Bad Eye to the more full-sounding and upbeat Never A Woman. The breathy, euphoric Ellipses is a real gem here, and despite the hedonism implied by the title, Stay Young, Get Stoned has more to do with the slowed down, sad chill of the 4AD label than any party ravers. Gangster No. 1 is a beautifully sung piece of good old fashioned, rollicking pop music and set closer Lessons seems to even have a slight country tinge built into its electronic pulse, a little Americana in the machine. "Morgan Kibby will be a name familiar to fans of dream-pop heavyweights M83's earlier work, including the Grammy-nominated 2011 hit album Hurry Up, We're Dreaming. Despite the album's success, it was to prove to be her swansong with the band, before going solo under the nom-de-plume White Sea and piecing together a string of online singles, artsy videos and the debut album In Cold Blood. Three years later and Crépuscule continues its occasional flirtation with fist-pumping electronic power-pop with Kibby's third album (if you include her soundtrack work on the decidely controversial arthouse movie Bang Gang). Assured, confident and packed with pop nuggets, Tropical Odds is full of singles. Kibby's vocals are big, her arrangements bigger (in a similar style to Tegan and Sara or La Roux) and the likes of Tove Lo, Katy Perry and Chvrches might do well to take note."